A few weeks ago I predicted a surge in books set in the 1920s (let’s call it The Gatsby Factor). 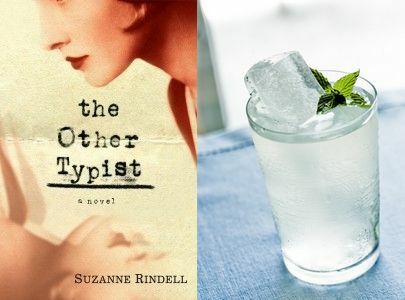 If The Other Typist by Suzanne Rindell is indicative of that trend, then the bar has been set wonderfully high. The Other Typist is set in New York in 1922. It’s the height of Prohibition and behind secret doors there’s gin aplenty. Rose Baker, raised an orphan in a convent, lives in a boarding house and works as a typist in a police precinct on the lower East Side. Every day Rose transcribes the confessions of the gangsters and murderers that pass through the precinct and while she may disapprove of the details, she prides herself on typing up the goriest of crimes without batting an eyelid. Her job is to record what will come to be known as the truth. But then the captivating Odalie begins work at the station and Rose finds herself bewitched by the new typist, as do her bosses – the buttoned up Lieutenant Detective and the fatherly Sergeant. The two girls become friends, flitting between the sparkling underworld of speakeasies by night, and their work at the station by day, however Rose’s fascination for her colleague soon takes an obsessive turn. Again, it’s The Gatsby Factor, but Rindell’s descriptions of speakeasies were captivating – I could taste the sharp lime in the gin rickeys, I could smell the cigarette smoke, I could hear the band, I was on edge, for fear of a sudden bust. Much will be made of Rose, an unreliable narrator and I must admit, she had me re-reading some lines, searching for clues. I have a strict ‘no-spoilers’ policy on this blog (I know some people find this annoying because they like to discuss the endings of the books). Thanks to my self-imposed policy, I can’t get into the nitty-gritty of the final twenty odd pages of this book. I re-read it twice (all the while thinking ‘Whaaaaaaat?!). It’s an ending that deserves discussion (much like the ending of Chloe Hooper’s The Engagement) – I need to de-brief with a fellow reader; I need to compare notes; I need to explore the possibilities. So basically, all of you need to read The Other Typist as soon as possible. 4/5 If you loved The Dinner (for its unreliable narrator) and The Engagement (for its gothic, twisted ending), then take an historical turn and read this book. I received my copy of The Other Typist from Penguin Books Australia via NetGalley in exchange for an honest review. It’s all bathtub gin and cocktails in The Other Typist. And I can never say no to a Southside Fizz. Well it might frustrate you in that case! Hmmm…I will be reading it shortly. I got my ARC last week. This one is highhhh on the tippy top of my want list. Great review! I wouldn’t mind a huge trend in books set in the 20’s. I love the time period. Thank you for your intriguing review. Certainly the most gripping book I’ve read in a very, very long time! Ahhhh. I am just realizing that this is an Amy Einhorn book. Even better. I am working my way through her list, off and on, now. No, it’s by Suzanne Rindell…. but clearly I should be reading Einhorn! Yes, I know that it is by Suzanne RIndell. Amy Einhorn is a small subsidiary of a larger publishing house who released the book. Their goal is to publish books that are literary quality but that will still appeal to a general reading audience. One of the books published by Amy Einhorn was The Help. I have the list on my blog in the menu bar if you are interested in the books they have released. Der! Of course. It was published in Australia by another publisher so the Einhorn logo not in my face! I LOVED The Help. Will check out what else they’ve published.